In May of 2010, Faith For Today celebrated its 60th anniversary. 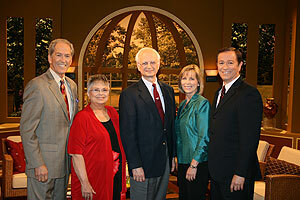 To mark this milestone in Adventist broadcasting history, the ministry held various celebrations around the country via camp meetings, taped a one-hour television special, Sixty Years of Faith, with the Fagal family, and ended the year-long celebration with an extraordinary evening vespers at Loma Linda University Church. In photo, left: Dan Matthews, Kathy Fagal Prall, William Fagal, Jr., Gayle Tucker and Mike Tucker.